A Nova Scotia cultural and artistic landmark Nova Scotia's most unique home. On the road to Halls Harbour, north of Kentville, is a delightful landmark in our cultural landscape. Known locally as the “concrete house with the deer in the yard,” this unique property is surrounded by concrete lawn sculptures of deer, a mountain lion, giant mushrooms, and other fanciful figures and furniture. Inside, the house is as it was built: every surface lovingly fashioned from cement and finished smooth with paint. A decorative instinct is evident from mantle to newel post, from chimney to dovecote—the impression is of a magical, sculpted cottage, tailor-made for an uncommon individual. Charles Macdonald traveled the world as a ship's carpenter at the end of the age of sail. The places he visited, the people he met and the sights he saw made an impression on this artistic young man. He returned home with a head full of ideas about how to shape an ideal life. 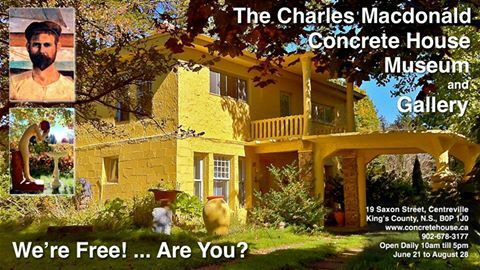 He established a concrete brick factory in what later became his home for over 40 years, and is now open as the Charles Macdonald Concrete House Museum. His views on labour and democracy make his story one particular to his times, and of interest to us today. His philosophy resulted in improvements to the quality of lives of his workers and to the community to which he dedicated his life. 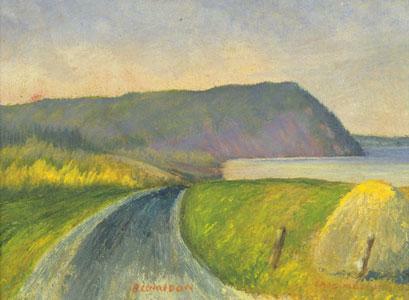 His artwork, sculptures, paintings, and rugs hooked by his wife Mabel provide a record of rural life and give importance to the landscape and values of Nova Scotians in the middle part of the last century. 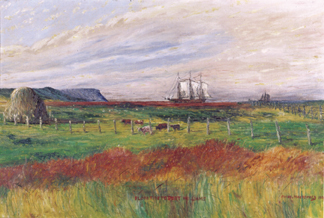 Although he would travel around the world, Charles Macdonald spent most of his long life in the rural Annapolis Valley of Nova Scotia. Born into a family of six children in Steam Mill, Nova Scotia, Macdonald's father worked as an apple grower and his grandfather as a Presbyterian minister. Neither farming nor ministry held very much appeal for Charlie, however. Art found him early in his life and he vexed his schoolteachers by drawing in class. When he was only fifteen years old, Charlie left school for good. For the next decade of his life, Charlie worked in and around Kentville, the shire town of his native Kings County and only a few miles from his birthplace of Steam Mill. Apprenticed first to a coffin-maker and then to a wheelwright, Charlie did not make very much money but did become a proficient carpenter. He also found plenty of time for artistic pursuits. Some of his adolescent pencil-sketches survive still. Charlie's observant eyes and careful hands have left us a record of his pastoral world of forests and fields, cows and rabbits, farmhands and woodcutters. It was a world he soon would leave behind. Charlie had hung around boatyards and watched all of the ship launchings that he could throughout his teens and early twenties. In 1898, he sailed away. The Charles Macdonald Concrete House is operated by the Charles Macdonald House of Centreville Society and funded in part by the Community Museums Assistance Program of the Nova Scotia Museum.